I assume this is controversial, but I want wptexturize to *always* be a no-op. I know I'm not alone on this. There exists a 3rd-party "wpuntexturize" plugin, but it is insufficient; even using that plugin, I keep running in to places where texturization is happening anyway. Rather than making us play whack-a-mole with all the places it gets turned back on, can't we please just have a checkbox to disable it globally? Alternately, if you would make wptexturize be a pluggable function, I could just re-define it. As it is, with each new release, I am forced to modify the source to add "return $text" as the first line of the function. patch-wptexturize.patch​ (959 bytes) - added by toscho 7 years ago. 19550.diff​ (1.1 KB) - added by nacin 7 years ago. 19550.2.diff​ (1003 bytes) - added by SergeyBiryukov 5 years ago. 19550-docs.diff​ (725 bytes) - added by miqrogroove 5 years ago. Please don't open new tickets for old issues. Instead, leave comments on the old tickets. The request to make wptexturize() a pluggable function is not covered by these old tickets which address singular problems. I support this request, because wptexturize() is used in eight places directly, not per filter. So we should either move wptexturize() to pluggable.php or replace all direct calls with hooks. Pluggable functions are a lousy way to fix this. We should replace all direct calls with hooks. The question is how we name such a filter. And if we need more than one name. 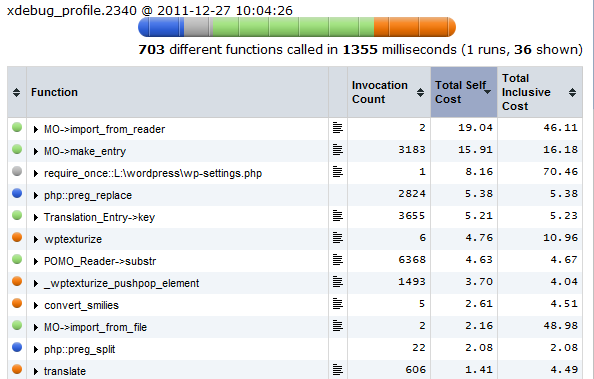 Actually, what would be the point in disabling wptexturize() for plugin and theme descriptions? If wptexturize was a pluggable function that I could turn into a no-op, it wouldn't matter to me that random plugins re-add it to the_content filter because they think I want it there. What if we extend just the function? Looking again through this ticket, I still haven't heard an actual use-case for disabling wptexturize(). wptexturize() changes quotations, link titles, samp and var by default. Yes, you can filter each case, but if you don’t need the function at all? Plus, it is rather slow. wptexturize() changes quotations, link titles, samp and var by default. The performance issues are caused by the regexes, I don’t see how to fix that. The patch just gives more control for those who think they may need it. And it doesn’t hurt anyone. And it doesn’t hurt anyone. Yes it does; each extra filter adds a tiny bit of overhead, both in terms of page load and of maintenance cost. apply_filters() is called in this function anyway – so there are no measurable page load costs (do I miss anything?). Checking side effects is up to those who use the filter. The output of wptexturize() is already different for each language. If what you're asking is "why do I want to disable wptexturize? ", I thought that would be obvious. That function does certain things -- namely taking the characters that I typed, and turning them into other characters -- and I don't want that. I want to see the characters I actually typed instead. I'm not nitpicking just about how it's translating my quotes, or whether one particular hyphen is being rewritten right. I want it keep its hands completely off of my text. If I had wanted curly quotes then that's what I would have typed. If other people want that, great. But please don't force this "feature" on me with no reasonable way to disable it. Yeah, I have written a ​plugin like this some time ago. It doesn’t catch the problem ​@jwz mentioned and of course not the hard coded calls. The new hook would help to enforce a consistent behavior. It seems like 19550.diff​ would work. Testing the filter's result before running the filter seems unwise in 19550.diff. The result in stored in a static variable for subsequent calls, I don't see anything wrong with that. If the purpose of the filter is to prevent wptexturize from altering the output, this patch will not do that. The filter result has to be tested after the filter, not before. I see what you mean, the filter only works for subsequent calls, not for the initial one. 19550.2.diff​ should work for every call, including the initial one. Now it looks like a good run-once filter. I suggest 3.9 Milestone. Can't see any reason to keep this ticket open beyond that. Add a $run_texturize static var to wptexturize() that is filterable via a new run-once filter: 'run_wptexturize'. Allows user to disable texturization. Add inline documentation for the run_wptexturize filter. Props miqrogroove for the original patch. Also what code could I use in a child theme to enable wptexturize? #17926 was marked as a duplicate.